The "tropics" are not a plot of convenient forest in Costa Rica; they are an enormous realm of patchiness, and any theoretical thinking based on presumed general properties is bound to become an in-group exercise in short-lived futility. Tropical America encompasses a great diversity of habitats. In a single day's drive in Ecuador it is possible to pass through Andean páramos (moors at a high elevation), cloud forests, lowland rain forests, marshes, mangrove swamps, and even desert beaches. These habitats are all tropical, yet they have little in common except geographic proximity. It would be difficult to describe them all in a single short book. The lowland forest -- the jungle of common parlance -- is the subject of our discussion. But there are many kinds of forest in the tropical lowlands of South and Central America. We will focus in particular on the lowland rain forest. The greatest expanse of this forest is in the Amazon basin. The Amazon forest is one of the wonders of our planet, and this vast expanse is the largest tract of rain forest in the world. But not all rain forests in tropical America are Amazonian, and although they may look insignificant on the map, the total area of these other rain forests is substantial. The most important of these non-Amazonian rain forests are those along the Caribbean coast of Central America, the northwest coast of South America, and southeastern Brazil. Tropical rain forests are not accidents of nature, randomly placed on the earth's surface. There is an order to their distribution, and to understand this order we must consider how our planet hurtles through the universe. The earth rotates about its axis once each day and travels around the sun once each year. This means that every point on the earth's surface receives the same amount of daylight each year, a total of 4,380 hours (give or take a few minutes, which we make up every so often in leap years). Our long summer days are precisely as long as our long winter nights and we finish the year in balance. This is true even in the polar regions, which have constant daylight during the summer and constant darkness during the winter. But the axis of the earth's daily rotation is not perpendicular to its orbit, and this inclination has several implications. It explains the familiar seasons of the temperate zones -- during the winter we are tilted away from the sun and during the summer we are tilted toward the sun. It also explains why the seasons are reversed in the southern hemisphere, because when the north is tilted toward the sun, the south is tilted away. What may be less obvious is that only part of the earth's surface ever receives direct overhead sunlight: those places that lie between two lines of latitude, the Tropic of Cancer in the north and the Tropic of Capricorn in the south. Within these borders, daylength remains more or less constant through the year. These are the tropics, or as Darwin was wont to call them, the intertropical regions. The tropics are characterized by climatic features that residents of the temperate zones find unusual. There is little seasonal change in temperature, the type of seasonality we are accustomed to. Days and nights are about the same length throughout the year. In the tropics you don't have to worry about sending your children off to school on dark winter mornings, but you miss out on lingering, lazy summer evenings. The intensity of tropical sunlight is difficult to describe, though the reason for its intensity is clear enough. It is related once again to the tilt of the earth. A beam of sunlight striking the earth in the temperate zones always strikes at an angle because the sun is never directly overhead. The radiant energy of this beam of sunlight is therefore spread out. In the tropics, the same beam of sunlight strikes the earth perpendicularly, or at least more directly than in the temperate zones, and the same amount of energy is therefore focused on a correspondingly smaller area. This effect is further intensified by the earth's protective mantle of air. Sunlight hitting the temperate zones at an angle passes through more energy-absorbing atmosphere than it does before striking the tropics. The intensity of tropical sunlight can be awesome. Newcomers must always be wary of its power, particularly if they are sporting pasty winter complexions; a shirt may not offer enough protection from the sun, and we have seen some visitors blister beneath thin coverings. The intense tropical sunlight warms the air, and tropical latitudes are characterized by warm temperatures. Since daylength is more or less constant through the tropical year, there is relatively little fluctuation in temperatures through the year. Those of us who live in the temperate zones are accustomed to heatwaves during the summer and cold spells during the winter, both of which are consequences of varying daylengths. The long summer days heat the air, and if the air is stagnant, this heat accumulates and can't be lost during the short nights. The perpetual darkness in the Arctic region during the northern winters allows ample opportunity for air to lose its heat, and when this frigid air pushes into our more temperate latitudes it can cause devastating cold spells. But in the tropics the uniformity of daylength means that there are no such opportunities for heat to build up or be lost. Although there may be seasonal fluctuations in temperature, they tend to be minor. The tropics are not necessarily characterized by high temperatures; if anything, they lack truly hot weather. The hottest place we have visited in tropical America was near Lake Maracaibo in Venezuela. We were searching for a mysterious little lizard, known from a single specimen collected in the early years of the century; but the heat made it difficult for us to work efficiently. The entire basin seemed suspended in still, hot air, and there were times when it seemed thick enough to eat. This was thornscrub rather than forest, and the scanty vegetation seemed to intensify the heat; yet as far as we recall, the temperature never reached 100 degrees Fahrenheit. This heat was exceptional apparently even for the region, and in general we rarely encounter temperatures over 90 degrees in our travels in the American tropics. When we lived in Arizona the summer temperatures were routinely over 100 degrees, occasionally exceeding 115 degrees, and summer heatwaves often bring temperatures over 90 degrees even in New England. So the lowland tropics we know are not extremely hot. But they are very warm, and they may seem even wanner because of the high humidity. There is an exception to the rule of the warm tropics. As you climb a tropical mountain, the air temperature decreases at a predictable rate: for every 1,000 feet you climb, the temperature drops about 3 degrees Fahrenheit. When air rises it expands. Expanding air does work, and work requires energy. If the energy needed to expand comes from the air itself, heat is lost during the work and the air cools. Anyone who has felt the cold air coming from a deflating inner tube after a hot summertime float trip can attest to the cooling nature of expanding air. This cooling with elevation is typical of any mountainous region, but it seems particularly noticeable in the tropics, perhaps because it can be so unexpected and so refreshing. Whenever we wish respite from the uniform warmth of the tropical lowlands in Ecuador, all we have to do is find our way to Quito, the capital city perched 9,000 feet high in the Andes, where we can enjoy a climate as pleasant and invigorating as early fall in New England. The difference in the intensity of sunlight on a tilted earth has other effects. It accounts for the major global patterns of air and water circulation, which in turn determine patterns of rainfall. Warm air is less dense than cool air, and when tropical air is warmed by the intense sunlight, it rises. As it rises, cooler air from the temperate latitudes takes its place, and the resulting flow of cool temperate air into the tropics has played a major role in both human and natural history. These steady winds, formed by the warming and rising of tropical air, are the trade winds, and as any sailor knows, trade winds move in predictable directions. The direction in which they blow is another consequence of the earth's rotation. The surface of the earth moves faster at the equator than in the temperate latitudes. This may not seem right, but it is true. The earth is more or less spherical, and its greatest circumference is at the equator. Since the earth rotates around its axis once a day, a church steeple in Quito actually travels 24,000 miles in an easterly direction every day. In the temperate latitudes, the diameter of the earth is less: at the latitude of Minneapolis, for example, the earth is less than 17,000 miles in diameter, and a church steeple there moves some 300 miles per hour more slowly than its counterpart in Quito. If a mass of air moves from the equator northward, it should veer in an easterly direction because it is moving faster than the surface of the earth in that direction. Likewise, an air mass moving from the north to the equator veers in a westerly direction because it is moving more slowly than the surface of the earth and loses ground in a direction opposite the rotation. If the air moving to the equator should be cool air replacing the warm rising air, the winds that result come from a northeasterly direction. These steady trade winds also push ocean water, and when this water meets land, it must go somewhere. The northeasterly trade winds in the Caribbean push water against the Central and South American coast. As the water deflects northward, it moves in a northeasterly direction and is called the Gulf Stream. This tongue of warm water flows atop the cold temperate Atlantic Ocean. Winds and ocean currents on a rotating, tilted earth help explain major patterns of rainfall. The trade winds pick up moisture as they flow across the ocean. Warm air can hold more moisture than cool air, and as the northeasterly trades enter the American tropics, they pick up moisture from the sea. As the air warms further, it begins to rise, and rising air loses heat. When the air cools, its capacity for holding moisture drops, and the excess water falls as rain. The abundant rains produced by the cooling of moisture-laden tropical air give birth to the lush forests of tropical America -- the piece of tropical nature that we find so fascinating. Rain forest requires abundant rain, but a large amount of rain is not in itself sufficient to nurture an evergreen rain forest. Tropical climates may show little seasonal variation in temperature, yet they often show marked seasonality in rainfall. It is this seasonality of rainfall that defines the rain forest. If the dry season is long enough and dry enough, trees shed leaves to reduce water loss. Tropical deciduous forests are sere expanses of brown and gray during the dry season, the only spots of color the green cactus trunks growing amid moribund gray trees. Yet come the rains, these forests quickly leaf out to look as verdant as any rain forest. When the rains quit for the year, the trees lose their leaves once again; but before they slip into dormancy, many of them burst into flower. In some forests it never becomes dry enough for all the trees to lose all their leaves. Even during the driest months of the year these forests look green. Here and there may be scattered leafless trees, but the signs of water shortage are evident elsewhere, though they may be subtle. Streams are crystal clear, shrunken, and seem to hold far more fish than they can possibly support. You can hear dead leaves crackle underfoot when you walk through the forest. These tropical moist forests are transitions between forests that have abundant moisture throughout the year and forests that are parched for part of the year; the plants and animals that live in them show affinities to both. The boundaries of true rain forest are difficult to define. Natural boundaries, unlike political boundaries, are seldom sharply demarcated and there may be complex interdigitations of one type of vegetation into another. Tropical rain forests may shade imperceptibly into tropical moist forests, which in turn may shade gradually into tropical deciduous forests. The forest that lines the banks of tropical rivers in seasonally dry habitats can more closely resemble a rain forest hundreds of miles away in both structure and species composition than it does a patch of deciduous forest several hundred yards away. There are trees that lose their leaves even in the wettest rain forest, but they seem to do so in response to their own cycles rather than to real shortages of moisture. Even during the driest months rain forest does not want for water. This doesn't mean that it has to rain heavily every month, but if there is not much rain there should be little evaporation. One of the rain forests we are most familiar with gets little rain during part of the year. During this dry season, however, the region is almost constantly cloaked in a layer of damp clouds. The relatively cool, moisture-saturated air ensures that plants lose little water to the environment, and the forests remain lush and green throughout the year even though the total annual rainfall is not that great. In general, lowland rain forests in tropical America receive at least 100 inches of rainfall annually, and monthly rainfall rarely drops below 6 inches. This is enough moisture to prevent most trees from losing their leaves, so that the rich lowland rain forests present a uniformly green aspect to the visiting naturalist regardless of when he or she is able to travel. There are some rain forests that show no real dry seasons. Although rainfall may be cyclic, there are no dry and wet seasons; these places are often said to have wet seasons and flood seasons. The wettest forests in tropical America, and perhaps in the world, are found along the Pacific coast of Colombia. In this area the warm El Niño current lies offshore, while the Andes protect the land from the northeasterly trade winds that might blow the moisture-laden clouds out to sea. Warm, moisture-laden air wafts in from El Niño. When it hits the steep western face of the Andes Mountains and cools, prodigious amounts of rainfall result. The average annual rainfall may exceed 360 inches in some parts of the Colombian Chocó. The Pacific coast of tropical South America shows clearly the relationship between ocean currents and rainfall. The warm El Niño is a small backcurrent that circulates off tropical America. Water is a marvelous heat trap, and tropical oceans often are warmer than the air over tropical lowlands. If warm, moisture-saturated air crosses cooler land, rain will fall as the air cools. If there are tall mountains, it rains more because the air cools even more as it rises. The major current lapping western South America is the Humboldt Current, a tongue of cold Antarctic water driven by the southeasterly trade winds of the southern hemisphere. Cold air picks us little moisture from a cold ocean, so when these cool breezes drift over warm land, rain doesn't fall. Parts of the Atacama Desert in Chile have never recorded a rainfall, and even Lima, the capital city of Peru, rarely receives rain. The arid coastal deserts of Peru and Chile give way to the lush rain forests of Pacific Colombia suddenly. Where El Niño holds sway, the rains fall and the land is cloaked with lush rain forest. Where the Humboldt dominates, the rain rarely falls and the land may appear barren of life. There is a zone of transition in western Ecuador very close to the equator, and here El Niño and the Humboldt fight for control each year. The currents shift slightly from season to season, and when El Niño prevails, there is a rainy season that is sufficient to foster the growth of forest. The effects of this warm current are usually felt around Christmas; it is the life-giving nature of the rains that gives the current its name (the Child). This brief characterization of rain forest in tropical America is necessarily simple. The climate of tropical rain forest is uniformly wet and warm, yet these terms are relative, not absolute. There is a distinction between climate and weather. 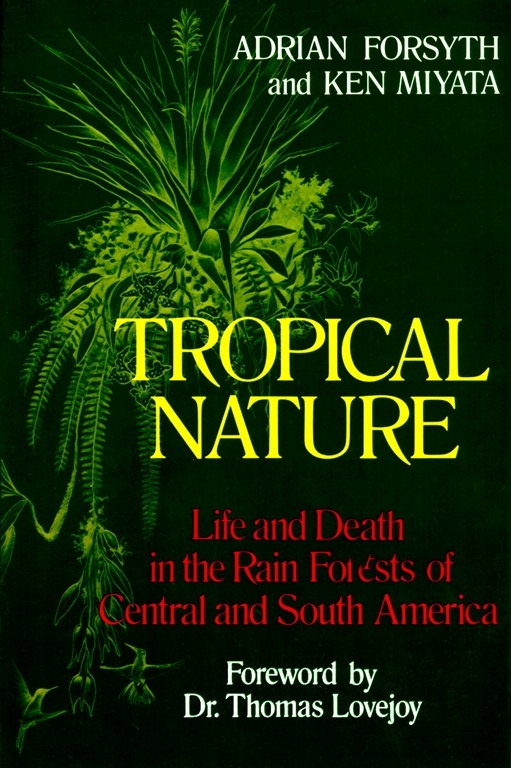 Within the human time frame the climate of tropical forest is reasonably predictable; but weather can be as capricious and unpredictable in the tropics as it is in the temperate zones. I was once in southern Peru, along the Rio Tambopata, during a cold spell. This region is reputed to have the richest fauna of any single area in the world: more species of birds and butterflies have been recorded there than anywhere else. Giant otters still swim undisturbed in lagoons they share with black caimans, and jaguar sign is seen regularly. My stay was to be brief, but I hoped to see as much as possible during the short time available. On the first night a strong wind blew in from the south, bringing rain and cool air. It got colder and colder, and by morning I was chilled to the bone beneath my thin sheets. The gray skies and scudding low clouds reminded me of an early spring storm in New England, and I shivered fill day in the cold rain and wind. This was not the weather I had expected in a lowland Amazonian forest, but apparently these cold storms are a regular, if unpredictable, element of the region's climate. Freak storms are not the only vagaries of tropical weather. Wet and dry seasons are predictable only in a general sense. We once wanted to study the burst of frog-breeding activity that occurs when a tropical pond fills. The rainy season in western Ecuador was supposed to begin in January, and we greeted each new heavy rain with anticipation, hoping it would signal the beginning of the deluge, but they were always false alarms. Finally, in the middle of February, we grew tired of the wait and struck off in search of greener pastures, only to return a week later and discover we had missed the big event. The pond, which had been a damp depression the week before, was a full-fledged little lake when we returned and the initial concupiscence of the frogs was spent. Annual averages concerning climate should also not be taken too seriously. The rain forests in eastern Ecuador receive about 200 inches of rain each year, and rarely does a month pass without at least 8 inches to keep the trees green. The last time I visited this rich forest, a curious brownish pall hung over the horizon as far as I could see. Even though I was born and raised in Los Angeles, the brownish haze seemed excessive. It was the smoke of countless fires, some burning in the rain forest itself, but most burning in the grassy llanos hundreds of miles to the north. The upper Amazon was in the throes of drought, and it was the only time I have ever been there when leaves crackled beneath my feet. Eventually the rains resumed, and the forest probably did not suffer much for the drought: yet the annual rainfall that year was far below normal. The tropical rain forest may not have a perfectly regular and predictable pattern of weather, but there is no question that weather forecasters in Panama lead a less stressful life than their colleagues in New England. They could probably tape their forecasts twice a year, once during the wet season and once during the dry season, play these back without modification on the nightly news, and be right more often than the most diligent and experienced meteorologist in the eastern United States. Although lacking the drama of seasonal change that North Americans are accustomed to, the warm, damp, relatively aseasonal climate of the tropical lowlands more than compensates by the wealth of life it supports. This is the climate responsible for nurturing the incredible diversity of life in the Neotropical rain forests. E. O. Wilson Tropical Nature is superior by virtue of its freshness and authority. It is an account of the extraordinary richness of the tropical forests by two gifted young biologists who have recently experienced it and are experts on their subject. They write with the crispness of journalists sending dispatches from the field. Ernst Mayr Combines excellent science, often based on original observations, with a warm sympathy for creatures big and small. A worthy successor to the writings of the great naturalists of the American tropics. I know of no better introduction to tropical biology. Newsweek Tropical Nature...seeks to provoke curiosity about the forests -- not just provide facts about them -- and succeeds splendidly....Tropical Nature evokes the magic and wonder of a world completely contained within itself. Smithsonian It invites an appreciation of biology as few other books do and does so with extraordinary grace and humor. Philadelphia Inquirer ...one of the best natural-history books in recent years. Lyrical, richly detailed and delightful to read. Scientific American In 17 chapters, each a brief essay on tropical nature observed, these two young field biologists have made a model of contemporary natural history, cheerfully speculative, concerned as much with large pattern as with diversity, chemically informed, thoroughly ecological and Darwinian to the core.